Line a tray with a silpat/silicone mat or baking paper. Combine the sugar and golden syrup in a medium pan. Heat slowly over a low-medium heat. Do not stir the mixture. You can swirl the pan to distribute the melted sugar and golden syrup but never stir. Once the mixture is a light golden brown, roughly 6-8 minutes, add the butter and pistachios and continue to cook until a medium golden brown colour, roughly 2-3 more minutes. At this point you can stir the mixture. Add baking soda and whisk to distribute but be careful not to overmix and deflate the bubbles. Pour immediately onto lined tray, spread thinly over the lined tray and allow to cool. Be careful the mixture will be incredibly hot. 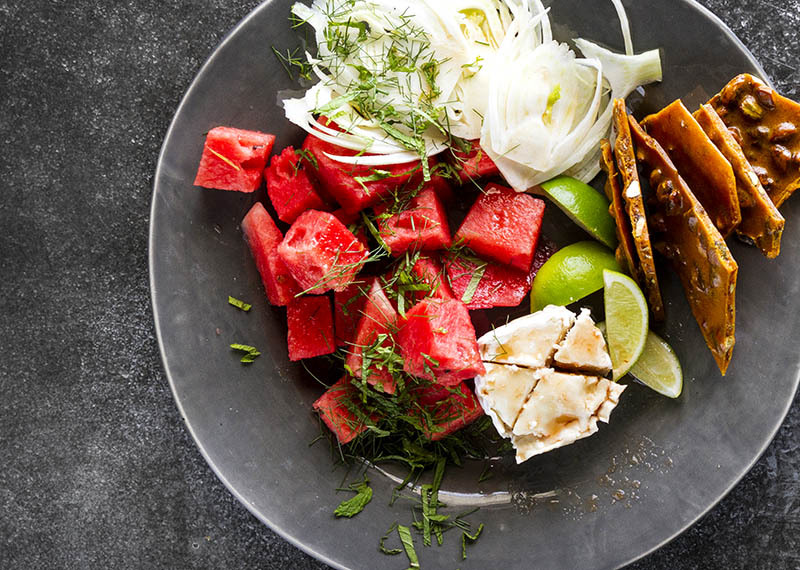 Thinly slice the fennel on a mandolin and roughly chop the watermelon. Assemble all the salad ingredients on a platter and drizzle over the balsamic reduction. Crush some of the pistachio honeycomb and crumble over the salad.